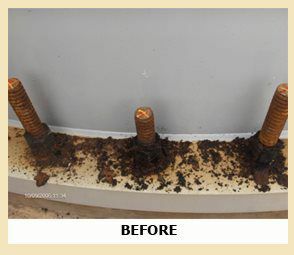 Mechanical rust removal on foundation anchor bolts with wire wheels is extremely time consuming, dangerous to personnel and damaging to the tower base. 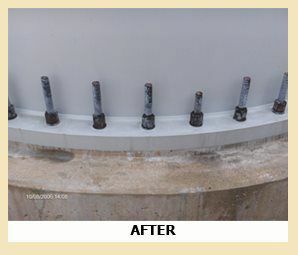 NTC Wind Energy has developed a bolt restoration service which requires no wire wheels. Instead, we remove heavy rust with our "nut buster" tool, which we developed and fabricated specifically for this purpose. Then, we apply environmentally friendly chemicals to convert the iron oxide (rust) to a protective coating of iron phosphate. Upon completion and drying, the bolts and base flange are pressure washed with an acid neutralizing and environmentally friendly formulation. Once dry, the bolts are coated with a specialty anti-corrosion grease and capped with our patented IronClad™ bolt caps. This service is available at discounted prices with the purchase and installation of bolt caps.